The Disney Infinity Toy Box 2.0 Summit will be held on August 16 & 17 2014 in Salt Lake City, Utah. The schedule is listed here, in USA Pacific Time, and you can virtually attend via live streaming. Questions for the Saturday afternoon panel discussion can be submitted via Twitter using #DisneyInfinity. Use the same hash-tag to vote for your favorite Toy Box 2.0 creations in a competitive showcase/playthrough on Sunday. As reported earlier the Disney Infinity 2.0 platform will introduce the superheroes of the Marvel Universe into the collector toy/digital game world with some beautiful character sculpts and challenging screen play. One of Infinity’s strong suits has been the Toy Box environment, a virtual game forge that facilitates the creation of your own worlds to play in. It’s a concept that has been embraced by fans who have submitted “hundreds of thousands of Toy Boxes,” according to John Blackburn VP and General Manager of Avalanche Software. 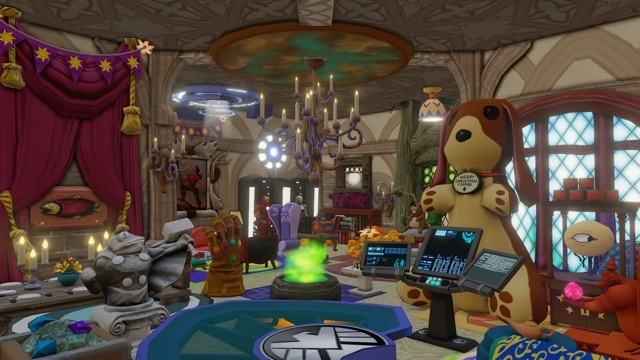 Taking feedback from the “active and vocal” Infinity community, Disney and Avalanche have announced major enhancements to Toy Box’s capabilities. While free ranging in an environment of your own creation was fun the addition of more structured game play is welcome, as are easier to use creative tools, and the ability to design unique interiors and go inside structures. It’s important to note that all your previous builds will be usable and editable in Toy Box 2.0, as will all game characters, and power discs. Get Under the Hood and Build Your Own Gamespace in Infinity Toy Box 2.0. • Creators – Tools that the player can place into the world in real-time, and a themed arrangement will be procedurally build that world within minutes. • Builders – Non-player characters (NPCs) that a player can drop into their Toy Box to build out detailed worlds. Players can use these pre-built Toy Box Games ranging from battle arenas to race tracks and customize them using the items saved in their personal Toy Boxes. The Disney Infinity: Marvel Super Heroes Starter Pack will feature Toy Box Game discs, which players can use to access standalone game modes including Tower Defense and Dungeon Crawler games that any character from across the Disney Infinity universe can play. Players can now create their own interior levels where they can build rooms and theme them to their favorite characters. 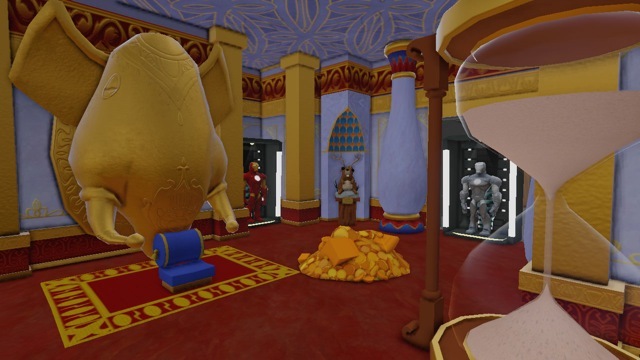 Unlock hundreds of furniture pieces and decorations based on iconic Disney and Marvel properties. New toys allow players to make more detailed games with beginnings, endings, winners, losers, result screens and virtually any type of game including races, battles, collection-based games, defense games or exploration adventures. • Challenge Maker – Allows players to create any type of game, including structured games within the Toy Box. 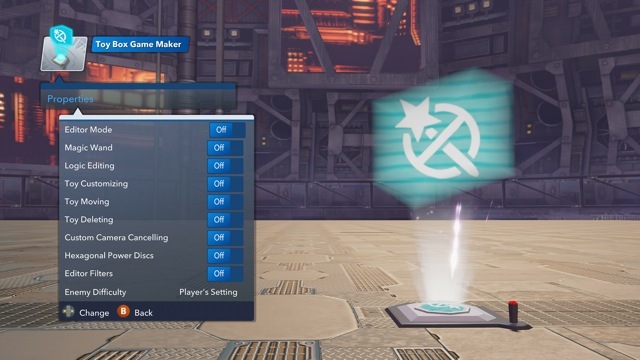 • Toy Box Game Maker – Allows creators to restrict core actions typically available in the Toy Box, such as the use of the magic wand. • Text Creator – Allows builders to write their own text bubbles in the Toy Box. All text is filtered through a safe chat server for friendly writing. • Creativi-Toys – More than 75 new Creativi-Toys allow players to customize their Toy Boxes even further. The introductory Toy Box will now be filled with Game Play Hosts who are available to assign missions and answer questions, as needed. Players are free to learn and explore on their own, but can ask a host for help and they’ll even be rewarded with extra goodies once missions are completed. • Increased Storage – Storage for locally saved Toy Boxes in a player’s private cloud has increased from 100 to 300 Toy Boxes. Support for downloadable published Toy Boxes has increased from 100 to 100,000 Toy Boxes. • Like and Search User-Generated Toy Boxes – Players can “like” their favorite published Toy Boxes and find others that are well received. Quickly search through the published Toy Boxes using categories (developer picks, most liked, most downloaded, newest, trending, all Toy Boxes and Disney 1.0), and further refine the search with filters (genre, character required, ability required and Toy Box Games). • Sharing with Friends – Share Toy Boxes with friends directly using cloud storage. I’m can’t wait to begin battling as The Mighty Thor against Loki and the Frost Giants on the streets of NYC when the 2.0 Edition launches later this season and I wouldn’t mind trying my hand at building an Asgardian game space with Toy Box 2.0.